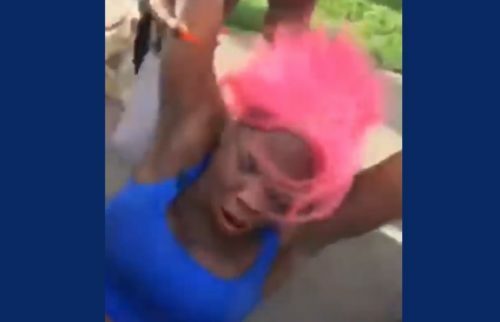 A man has been arrested in connection to the brutal beating of a transgender woman that was caught on video. A horrific video that was posted on social media this past Friday showed a crowd gathering in the streets in a Dallas neighborhood around Muhlaysia Booker, 23. In the video, a man starts to beat her, and later others join in, kicking her and holding her down. She tries to get away. A group of women surrounds her and carries her to a car. Booker was taken to a hospital where she was treated facial fractures. Her arm is in a sling. The violent video is not available for embedding off of Facebook and has a content warning. She told police that the violent attack started after she was involved in a minor traffic accident. The man who beat her shouted homophobic slurs, she said, and family members said she was attacked because she’s transgender. On Sunday, police announced that Edward Thomas, 29, was arrested for having an alleged role in the attack, although they did not say if he was the first man who beat her or another person in the video. “Chief [Renee] Hall alerted me this morning to the assault at the Royal Crest Apartments and I have seen a video of what happened,” Rawlings said in a statement. While the crime may have been motivated by anti-transgender sentiment, gender identity is not one of the protected categories in Texas’s hate crimes law. Sexual orientation and gender, though, are covered.